Rebecca Sullivan is a self-taught cook and has worked with some of the world’s best producers, environmental academics, activists, chefs and restaurants. As an eco-agronomist, activist, food writer, urban farmer and entrepreneur, Rebecca has worked on many a project any food lover would envy. From launching the Real Food Festival in London to working on Slow Food Nation in San Francisco, farming coffee in Uganda to teaching scientists the art of communications in the Maldives for the United Nations. Rebecca recently completed her Masters in International Rural Development and Sustainable Agriculture at the Royal Agricultural College in Gloucestershire, UK during which she focused on food security and a sustainable food future and is now undertaking another Masters converting to a PhD in Food History at the University of Adelaide. 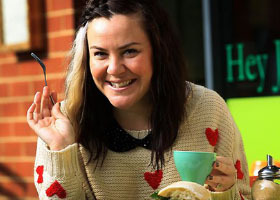 Appropriately Rebecca is an Oz Harvest Ambassador and currently developing an APP to help Aussies ‘use their leftovers, waste less and save money’. Part proceeds will go to Oz Harvest. Check out here Dirty Girl Kitchen project here. Easy as pie, this quinoa salad will bulk out your leftover roast, making it perfect for post-Christmas lunches and picnics.